This massive toolkit clocks in at 132 pages, 1 page front cover, 1 page editorial, 1 page ToC, 1 page SRD, 1 page back cover, leaving us with 127 pages of content, so let’s take a look! This review was requested to be moved up in my queue by one of my patreons, and winter’s always been the season for horror for me, so I was more than happy to oblige! First things first: I’m a sucker for horror and dark fantasy; I am exceedingly well-read regarding horror-literature, and RPG-supplements. This, alas, makes me a pretty critical fellow regarding supplements such as this, which purport to provide the necessary toolkit to play a proper horror game with an engine that is not necessarily made for it. As an aside: Neither 5e nor Pathfinder or similar games with a relatively high PC-power-level are made for horror games, but it is very much possible to use them as such, courtesy of the modularity of the systems. Such games may not be particularly adept at depicting purist Cthulhu-horror akin to what Call of Cthulhu does; instead, these systems excel at providing the frame-work for campaigns wherein the PCs are the lone, the mad and driven, those that dare peak beyond the veil and face the horrors lurking just out of sight, that battle these overwhelming foes. As such, and I have written on that subject matter rather extensively, the first thing that is important to drive home, would be the tone and how the players and GMs approach the game. I likened this to a contract of sorts: Players are expected to not attempt to “win” the game and instead focus upon developing the atmosphere and experience; similarly, GMs are expected not to abuse the pretense of a horror game to engage in a power-trip and kill off PCs just for the heck of it or to make a point. The second chapter provides the new write-ups for races that fit the idea of a horror-campaign, and indeed, I was delighted to find that the races themselves, in power-levels, tend to gravitate towards the more conservative side of things, even when depicting the more monstrous side of things. What makes sense from a narrative point of view certainly can be found among the abilities in mechanical representations. Calibans, the catch-all term for the somewhat disfigured individuals, for example, get a feature that lets them, once per long-rest-interval end up at 1 hit point instead of below 0. The rules provided here, to further use this example, counterbalance their more powerful critical hits by imposing disadvantage on all Charisma-based checks. This is as well a place as any to note that, while for the most part, the editing and formatting is consistent and maintains functionality, there are quite a few instances where minor deviations can be found. A reference to an attribute that is not capitalized here, racial features that have their names bolded, but not italicized (at least this deviation is consistent throughout most of the chapter – excluding the wretched, which are properly formatted), a spell reference not italicized – there are a couple of these to be found. Thankfully, these usually do not impact the functionality of the respective rules-material within. Among the races, we can also find changelings, the graveborn risen from humanoid races (with variable racial heritages), ravenfolk, shadelings, were-kin…and aforementioned wretched, who are basically living constructs. Mechanically, graveborn and were-kin are probably the most interesting ones here, as the former provides different ability score adjustments for 5 different were-species, and it makes original heritage regarding race matter, which is a big plus. While the more horrific races tend to be slightly stronger than the less horrific ones, it should be noted that social stigma and the like can and should be much more pronounced within the contexts of a horror game. The graveborn’s template has a slightly confusing formatting glitch in the Ravenfolk heritage column of its table, which implies an ability to choose size, which RAW the Ravenfolk race does not have. The next chapter provides the apothecary base class, which is, oddly, called “alchemist” or “pharmacist” a couple of times in the flavor text, which is something I’d certainly appreciate in a novel, but slightly less so in a gaming supplement. The class gets 1d8 HD, proficiency with light armor, shields, simple weapons, hand crossbow, the poisoner’s, medical and herbalism kits as well as the alchemy lab, and they get proficiency with Constitution and Wisdom saves as well as two skills chosen from Deception, Medicine, Nature, Perception, Sleight of Hand and Survival. The class comes with a proper equipment-selection and quick-build table. The class gains ability score improvements at 4th level and every 4 levels thereafter, and basically could be called a full spellcaster of sorts, save that the spell-engine is translated into so-called philters, with byproducts taking the place of cantrips. The supremely ambitious component of this class would be that it recodifies the spells as drams, oils, smoke bombs and throwable glass vials, which means that the respective base spellcasting engine does feature a rather extensive change of how these spells feel when they’re applied. The governing key ability modifier for the class is Wisdom. The class features gained are actually pretty interesting and well-chosen for their respective levels; 3rd, 6th, 10th and 14th level provide the so-called field abilities. A field of study is basically the archetype/primal path/etc. of the class, and three are provided…including experimental medicine that may duplicate restoration effects at the cost of exhaustion levels…and no, said levels may not be cured by the ability. Nice catch! Aforementioned alchemy lab item is presented alongside a pretty nice spell-list. I did not expect to like this neat class-hack to this extent. All core classes also receive their own archetypes, and the design continues to follow a path that is not the most simple one, but ends up being more rewarding. Let’s take the possessed berserker, for example – as you have guessed, this would be a barbarian primal path. This one is actually three archetypes in one: You get to choose whether your possession and black-outs stem from a possessing entity, a supernatural curse or an unholy lineage, and this choice radically changes the abilities you will gain as you progress throughout the archetype. I really enjoyed this fellow, more so that the by now somewhat obligatory sad/tragic bard college, which, in contrast, feels a bit less interesting. We also get the Entropy domain, the circle of primordial might, an undead hunter fighter, a corrupt contemplative monk (cool! ), the paladin oath of light (including proper tenets of devotion),a monster hunter ranger…and rogues can become detective. Sorcerors may choose the aberrant bloodline, warlocks can swear fealty to an undead lord (*cough* Strahd, Azalin, et al…) and wizards can elect to become void savants…which is interesting, courtesy of a unique cantrip that is pretty potent and which may instill permanent madnesses in targets. As an aside: The theme of void magic has also been done admirably for 5e by Kobold Press – the Deep Magic supplement on Void Magic makes for a great complement to this book. But I digress. However, as the book managed to allude to in chapter 1, the most common and beloved genre among horror adventures would be the investigation, and D&D 5e’s skill system is not necessarily geared towards monster identification. The book addresses this by introducing the new Monster Lore skill…but more interesting (and less intrusive) would be that there is a breakdown of the skill to present knowledge: A monster type is associated with an existing skill as the focus, and an affinity, which would be a class. Barbarians, for example, will be more knowledgeable regarding beasts, paladins regarding fiends, clerics regarding undead – this split of competences is explained in a concise manner and makes sense to me. It also ensures that all members of the groups will be in a position to contribute to the subject matter at one point in time. The explanation of the check per se is also tight and easy to grasp at first reading. The pdf also presents an array of diverse feats that include being a (not yet, but probably soon-to-be tortured) artist, the ability to tweak your spells to inflict necrotic damage, better hiding, being associated with the undead…the feats are as potent as 5e deserves and as thematically-consistent as the subject matter demands. Yes, there is a feat for PCs who want to be Grotesque. The book also contains a pretty massive equipment chapter that notes improvised weaponry, diverse kits, stats for neck guards, fortune-teller’s decks…you get the idea. The pdf also features an array of new spells, with appropriate classes noted. While the “At Higher Levels.”-header isn’t italicized properly for them, they do fit thematically and fit the themes. Damage isn’t beyond what you’d expect for the respective levels. Now, literature is filled with examples of rituals being performed by those not steeped in their lore, as well as the dangers this may entail. As such, the book provides a ritual-engine that is based on 5e’s already existing rules for spells with the ritual-tag, but does expand them with a misfortune table for flawed rituals, including the suggestion of curses. The rituals themselves are classics – from exorcism to magic seal the 4 such rituals presented made me grin from ear to ear. This is certainly a section that could have used a couple of expansions. Anyhow, there obviously also are magical items within this tome, and these range from the bag of rats (cue in all endy-makes-a-bag of rats/kittens-complaint ever…) that does what it says – it calls forth a rat swarm. No, the item, ironically, can’t be abused. More lethal murder blades, cursed gems, idols sanctified by demons, a magical grave-robber’s shovel...a fun selection here, with item scarcity properly noted. Chapter 8 of this tome deals with a topic close to my heart – hazards. From poisons (which include ones that cause temporary petrification) to diseases, we get a couple of stars here, including rules for calcification viruses (yet, now you can quickly convert more than one module from PF or OSR-games) to rosen doom, these often tie back to classics. The Marblewife syndrome certainly hearkens back to visions of Pygmalion, and Telepathitis…can just be nasty. In this chapter, the author obviously went all out and blended creative tricks with classic tropes for fresh and fun executions of diseases that the players will fear. Now, since I already touched the matter of conversion: One of the issues you may encounter when converting a late 3.X or PF module would be haunts. Well, no longer. The supernatural effects and the like now receive a proper, easy to grasp and comprehensive engine in 5e that can vastly enrich horror-gameplay and take a ton of work off your shoulders. And yes, sample ones are provided. ….and this is where we take a look at the supreme discipline of any such horror toolkit ever. Fear & Madness. Too loose, and things feel wrong; too stringent, and the roleplaying aspect is lost. D&D 5e already sports a pretty robust madness-engine, thankfully, and the book indeed does build on them, suggesting changes to a couple of spells, providing additional disorders and suggestions for nonmagical curing, etc., as well as Medicine skill uses for proper care of the afflicted. The rules-suggestions here can be picked apart and chosen as per your preferences and remain, as a whole, sufficiently modular. The book, in a plus I did not expect, actually discusses the effects of combining insanity and the realities of a fantasy setting in some detail. That being said, somewhat to my disappointment, we do not, for example, get a 6-step fear condition-progression, which imho would have suited the theme rather well. This concludes the section that is intended for both players and GMs alike – so yeah, the book is smart in that the player-facing components start out the supplement. Advice for the GM regarding treasure and campaign structure, about places where the planes blur and mingle…you get the idea. Even if you are a veteran, the GM-section does have something for you: Approximately 20 pages of the supplement are devoted to delightful horror monsters, featuring often rather efficient b/w-artworks that drive home rather well how twisted these are. Some classics like dark folk are found here alongside corpse dragons and marrow oozes. And yes, where applicable, lair notes are provided. I believe in credit where credit is due: The formatting here is much more precise and consistent than it previously was – big kudos! The section goes beyond that and provides something that 5e often shirks away from, even though it is super helpful: Templates. Need a mastermind, a serial killer, etc.? Just take the base critter, apply the template, et voilà! It’s not for every critter, obviously, but for key NPCs? Damn fine. I love these, but oddly, ability names have neither been bolded, nor italicized here. We conclude the book with a final, sample villain and some ideas. Editing is generally very good on a rules-language level, and similarly rather impressive on a formal level, particularly considering the size of this massive toolkit. That being said, the same can’t be said about formatting. It is only in this aspect that the book truly feels somewhat rushed – one concentrated pass to ensure that spells and features are properly formatted would have taken away the one constant aspect that kinda bugged me about this book. Layout adheres to a 2-column full-color standard, with blood-splotches and a grimy feel – it is just as beautiful as we’d expect it to be. the interior artwork greatly benefits from the use of b/w-artworks that, in stark, black lines, set themselves apart from the background. The artworks manage to blend the copious original pieces and stock art in a quasi-journal-like manner that ends up looking impressive in how concise it is. In short: The layout is gorgeous. The second aspect, wherein the book feels slightly rushed, apart from formatting, would be the bookmarks. We only get bookmarks for the chapter-headers, which means that navigation of the electronic version could be a tad bit more comfortable. I cannot comment on the print-version, but considering the broad scope in which this book may be applied, I’d probably designate that version as the go-to iteration. I am honestly impressed by this massive toolkit. Not only has author Ismael Alvarez written, at least in my book, perhaps his best supplement so far, he has actually managed to craft a toolkit that is almost ridiculous in its usefulness. He has written the 5e-horror-conversion guide that I never had the time to finish writing for my home games. Am I going to use all components of this book? Heck no. But I’m bound to return to this time and again – from the haunt-rules to the diseases to the surprisingly cool (and still down to earth) races to the class options, this turned out to be a veritable treasure trove of horror material. Granted, the book does show some signs in its formal criteria that it had to be rushed to an extent to meet the Halloween-season head-on, but these formal hiccups don’t really impede the quality of what’s here. While these do keep it from claiming a spot among my Top Ten candidates for the year, I am still exceedingly impressed, and grateful, I might add, to now have basically a one-stop-shop destination for horror gameplay and 5e, whether it’s for Ravenloft, Shadows over Vathak or other settings and supplements. As such, this book, in spite of its minor blemishes, claims the 5 stars + seal of approval that rightfully belongs to this tome. 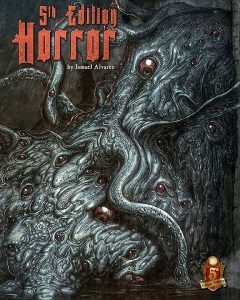 If you even remotely enjoy horror games and want to bring that to 5e, well, then this is your book. You can get this amazing toolkit here on OBS!